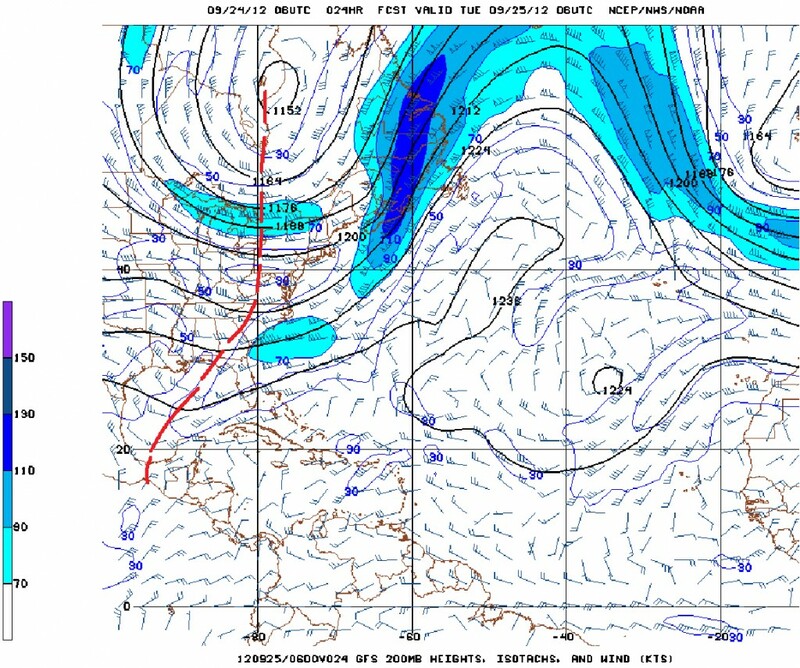 The upper level trough will drift eastwards over the next 36 hours and the southern portion will lose its identity by Wednesday. This feature will support localized convection over Belize through Wednesday, especially along the coast. A return to drier weather is expected later on Wednesday through the rest of the working week and the upcoming weekend. 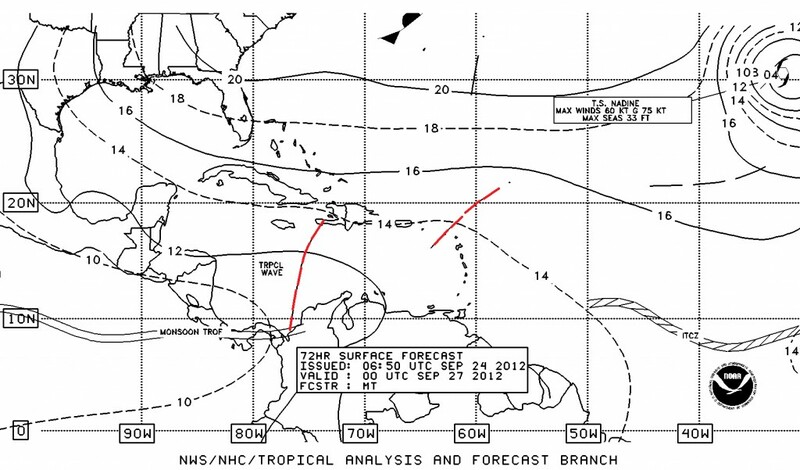 No tropical cyclone is expected to form over or move into the Caribbean region during the next seven days. 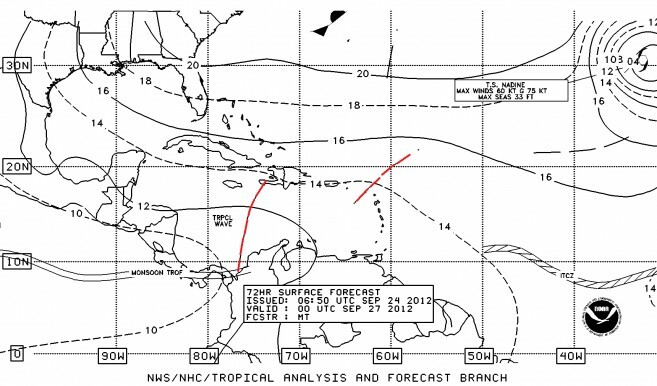 In the Atlantic, tropical storm Nadine was located near latitude 31.7 North… longitude 27.8 West. Nadine is moving toward the west-northwest near 7 mph. A turn toward the west and west-southwest are expected over the next couple of days. Maximum sustained winds are near 50 mph with higher gusts. Little change in strength is expected over the next 24 – 48 hours. Rainfall rates over Belize will be in the range of 0.75-1.00 inch on Sunday, Monday, and Tuesday in the heavier showers and thunderstorms, especially along the coast and in the north. Elsewhere, rainfall daily rainfall rates will be in the range of 0.25-0.50 of-an-inch. Rainfall will diminish later on Wednesday through the weekend, with daily accumulations of only 0.10-0.25 of-an-inch in locally isolated showers or isolated thunderstorms, especially in the interior and in the hills. Figure 1 GOES IR Satellite picture for 7:30 am, Monday Sep. 24, 2012, showing weak convective activity off shore southern Belize. 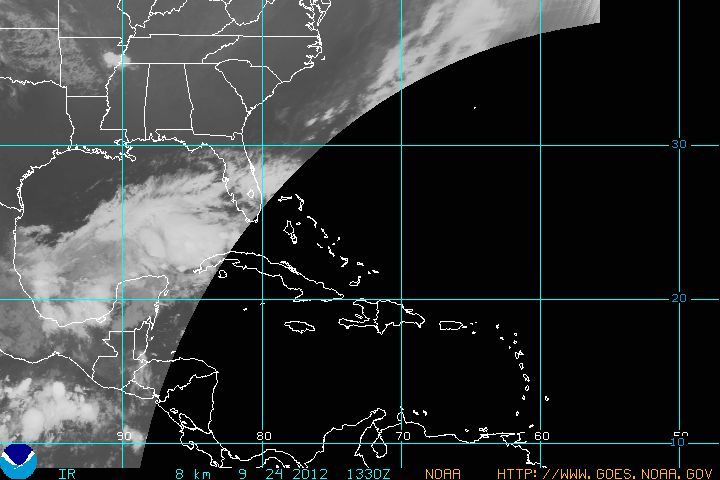 Deep, widespread convection evident across the SE and SW Gulf of Mexico. No satellite image for the greater Caribbean Sea area available since 9:00 pm on Sunday, Sep. 23, 2012. 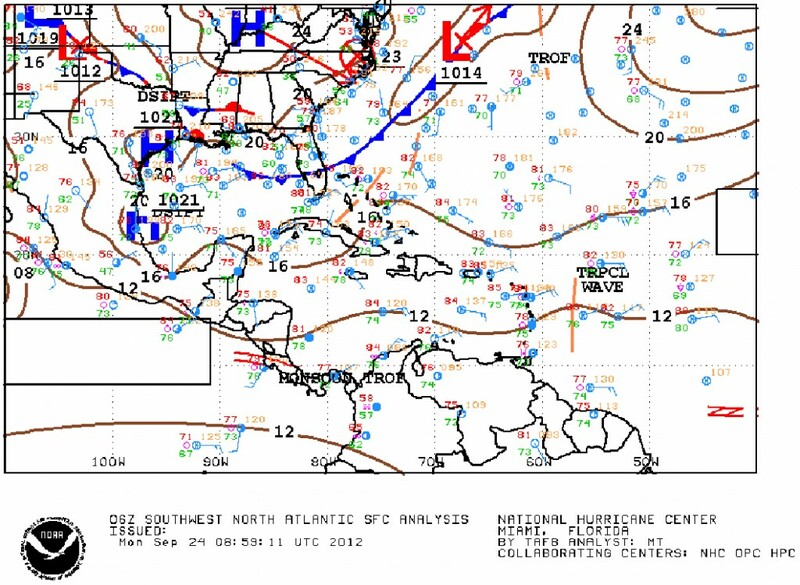 Figure 2 Surface map valid for 9:00 am Monday, Sep 10, 2012, showing weak ridge of high pressure from the Atlantic into the SE Gulf of Mexico. Weak pressure gradient over the Caribbean. 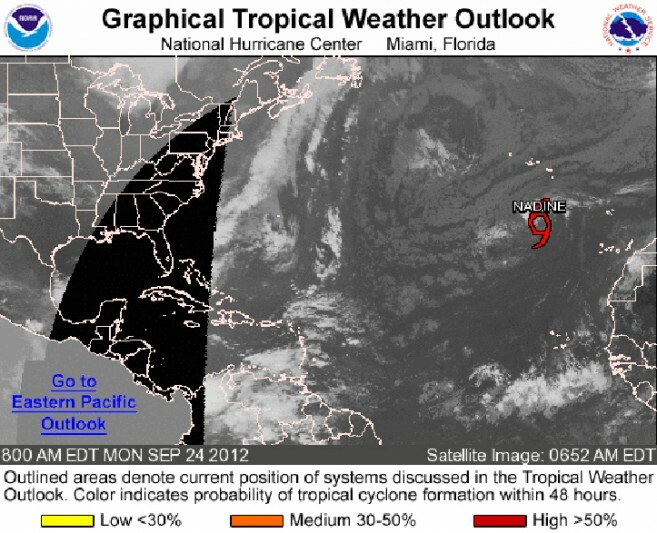 THE NATIONAL HURRICANE CENTER IS ISSUING ADVISORIES ON TROPICALSTORM NADINE...LOCATED ABOUT 455 MILES SOUTH OF THE AZORES. ENSO-neutral conditions continued during August 2012 despite above-average sea surface temperatures (SST) across the eastern Pacific Ocean (Fig. 1). Reflecting this warmth, most of the weekly Niño index values remained near +0.5°C (Fig. 2). The oceanic heat content (average temperature in the upper 300m of the ocean) anomalies also remained elevated during the month (Fig. 3), consistent with a large region of above-average temperatures at depth across the equatorial Pacific (Fig. 4). Possible signs of El Niño development in the atmosphere included upper-level easterly wind anomalies and a slightly negative Southern Oscillation Index. Despite these indicators, key aspects of the tropical atmosphere did not support the development of El Niño conditions during the month. In particular, low-level trade winds were near average along the equator, and the pattern of tropical convection from Indonesia to the central equatorial Pacific was inconsistent with El Niño with the typical regions of both enhanced and suppressed convection shifted too far west (Fig. 5). Because of the lack of clear atmospheric anomaly patterns, ENSO-neutral conditions persisted during August. However, there are ongoing signs of a possibly imminent transition towards El Niño in the atmosphere as well as the ocean.